Currently reclaiming their reputation as a company who make miniatures, rather than simply posting very small pictures of them, RAFM's Regiments of Blood line adds an air of Satan to this showcase. Spread across their 3 axemen, swordsmen and crossbowmen you'll find plenty of skulls, a few teeth, scale and plate, twisted faces and a general air of fallen decadence. You could paint them shiny, but the RAFM house team have done a marvellous job with black and red, invoking worn leather armour, countless wars and general chaos. The Blood Lieutenant, who could lead any Chaos Knight unit, adds fur, cloak and a horned helmet to the group. If these soldiers are closer to basic chaos warriors than chaos knights, spare a thought for the standard bearer whose demonic visage and clawed feet could earn him a spot on the mutants showcase! One of the 'Player Characters' line is also a chaos knight: the Evil Male Gothic Fighter is fully armoured, horned and bearing a spiked shield (he's also got a sword). The quality of sculpting at RAFM is variable, but luckily these figures look okay. As well as a massive axe you also get your choice of a hammer, mace or sword, but you need to specify when ordering. The casting, like the sculpting, is done by Andy, so you can be assured of the quality. He's also a relatively modest price - yes, this is a big figure! Viking Forge don't just make Vikings! (Okay, so you probably knew that). They have a wide ranging fantasy line which includes the 'Forces of Chaos'; regrettably though, there are only four figure types and no photographs. 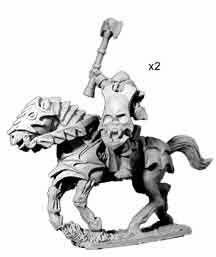 You can choose from the Lord of Chaos on Horse, Chaos Knight on Horse, Chaos Warhound or the Dismounted Knight of Chaos, whose price suggests a horse isn't included. Indeed, $6.95 for the Lord and $4.95 for the knight are far from cheap (especially for a small name), but at least they don't want your bone marrow like some leading companies. (Please note, these are reproductions of the old Asgard line). People who know Excelsior's Chronopia line will already be getting excited: if they did their dark elves with big armour and axes like boiler doors, what on earth are their chaos knights like? Well, they don't have an official line of them, but many of their figures easily suffice. The Firstborn Knights are the obvious place to start for rank and file. Most of them wear plate on their legs and chest, with bare arm, gauntlets and obscenely large shoulder pads. Hidden between said pads is a helmet (you might have to look closely...). Two main types are available, two swordsmen who carry jagged blades and an identically dressed pair with large maces. Both come with shields and can be led by an appropriate character figure: either the Great Swordsman or the Great Maceman, both of whom carry double handed versions of their weapon. The swordsmen also have a leader - whose rank is indicated by the intricate plate on his arms! - and standard bearer. The characters come singly and the basic grunts in blisters of two, but Excelsior offer a boxset with four of the swordsmen plus all the sword bearing characters. The Firstborn Iron Guard also have large shoulder pads, but they're far better looking; indeed, the Iron Guard armour is generally more detailed and less cartoony than other Chronopia knights. Carrying diamond shaped spears and shields with a hint of design behind them, the variants are supported by a standard bearer and a leader who's thrusting forward. As fully armoured Chaos Knights with Spears are rare, these are certainly a find! Again, the rank and file are sold two to a blister, characters separately, and there's a boxset of six. It's worth mentioning that the Firstborn Crossbowmen and Archers are also partly covered in very similar armour. You don't find many missile troops with thick helmets and plate, and these could certainly be fielded as some Chaos Knights who have decided to hang back and shoot, especially with the hulking Repulsar Marksman at the front. 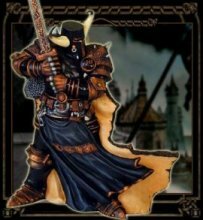 The Firstborn range features a number of individual characters, like the Night Walker (a very D&D style chaos warrior) and the Superb Judge, who adds thick black robes to his armour. (Nice and creepy.) There are also two mounted minis, a knight and an axeman. The former rides a whopping great horse but just about looks decent - maybe a general? - while the latter is simply silly. Meanwhile, the troops of the Devout line are anything but. Essentially the same form as the Firstborn knights but with added skulls, the Devout Swordsmen and Greatswords wear robes, more pointed armour and carry sodding great swords, while the Cursed Warriors sport even more cloth over plate, more points and axes. They are, in effect, generally more chaotic and evil looking that the Firstborn, but not so different you couldn't field them together with the Devout as veterans. The Swordsmen and Greatswords have leaders and standard bearers. 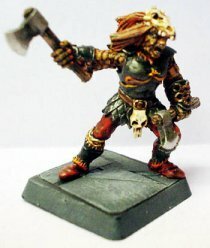 For all these miniatures, the sculpting is good, the casting excellent and the bases round. Guardian's Order are producing a line of Superhero figures based on the Silver Age Sentinels. Now, I accept that some passionate comic fans will be aghast at the context shattering inclusion of the Kreuzritter (Monarch of Thule) here, but I don't care. He's wrapped from head to foot in silver plate, has horns on his helmet and is raising his arms: he's blatantly a chaos knight leader. (Trainspotter's take note, it's a Sandra Garrity sculpt.) Luckily for a game going after popular appeal he's unpainted and supplied with a circular base. Amazingly for a company whose fantasy range is famous for, err, providing alternatives to those of a larger manufacturer (will that pass the legal department? ), Black Tree have very little in the way of Chaos Knights. You actually have to dig deep into their old Harlequin figures before you find anything, and then only a few possibilities from the Drakul line. There are only two cavalry figures (one knight in a pack of two, one lord alone), but with a steed in bat-wing armour and a shields entirely shaped like a skulls, they're unambiguously chaos (you may not have noticed, but apparently skulls = evil.) You're then left with a range of Drakul foot. 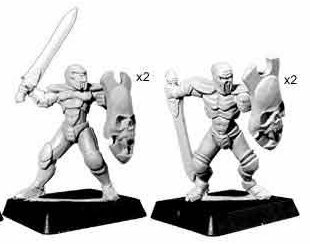 The Drakul elite troops are covered in a smooth, somewhat robotic armour; three are armed with axes and skull shields (2 of each in a pack), while three more split axes, swords and maces (2 of each in a pack). There are also three Drakul knights, but they're thin armour and sword/skull shield combination leaves them looking suspiciously similar to the three Drakul Warriors: they'd easily mix. There's also a command group of three figures dressed just like the warriors (well, one's got a banner and the guy pointing must be a leader...) and three 'fighters' who have the simplest armour and double handed weapons. To be fair, the repeated skull motif and similar helmet shapes - plenty of which are also skull shapes - gives them a unity lacking in grouped character models. However, most of these figures are definitely at the spandex end of the chaos market, good for those serving perverted lords, not ferocious ones. Sculpting is good for Black Tree fantasy, the lead casting is good and every figure is slottabased. Sovereign Stone is a new game world based on the work of Weiss and Hickman...and if that wasn't bad enough, it's a D20 system. Stop running away! Come Back! They have Chaos Warriors! Well, sort of. It's difficult to know what Dagnarus, Lord of the Void and his two sidekicks Valura and Shakur the Vrykyl actually are, but with think, all-encompassing armour, a hair/spike/plume somewhere between quills and dreadlocks and imposing visages, these are perfect chaos leaders. Sandra Garrity's sculpting is generally good but the sword arm on Shakur seems too indistinct. For all I know Shakur emerges from shadows, but this is still a problem for Chaos Warrior generals, as might be Valura's lizardy helmet/face. They're also cast into irregularly shaped bases. Heartbreaker Hobbies have since morphed into Target Games, but their fantasy lines were of the old school and named after their sculptor. 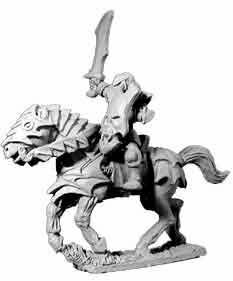 Both Phil Lewis and Chaz Elliot did us proud with two ranges of Chaos Knight, the former's including a leader, musician, standard bearer, champion, sorcerer but, oddly, only one basic knight (6501-5, plus 6510). The latter mixed standard Chaos Knights (all with different hand weapons) and Plague Knights. 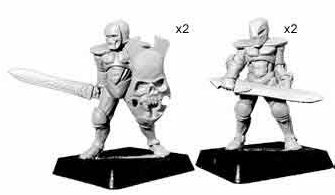 In addition, Heartbreaker also produced army packs: a set of 'Chaos Knights', a set of Chaos Command (3 figs) and some Chaos Warrior Knights (8 figs). Pictures of these are scattered across the net in sell-offs and online galleries, but working out what's been converted etc. makes description tricky. They generally conform to all the Chaos Knight standards: hulking suits of armour with the odd spike, maybe a skull, brutal weapons and the occasional mutation. Both sculptors are still highly regarded, even if these figures are somewhat basic by today's standards. Dark Sword's remit is turning fantasy illustrations into real life through faithfully sculpted figures. With a Larry Elmore line well underway, attention has turned to the art of Keith Parkinson and, luckily for him, the sculptor is none other than Tom Meier himself! Needless to say, the figures are fantastic. In this showcase we're concerned with what's technically a demon from 'Lost Prince 2'. In reality, it's a perfect Chaos Knight (now Tom's added a large axe!). Taller than some, the dynamic pose and realistic armour contrasts greatly with the 'wearing a steam engine' approach of other companies, but the 'demon' benefits totally. However, he's sold as part of six-pack with five very different figures; a large square base is supplied. 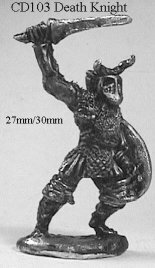 Dolmen make substantial resin statues for fair prices, and this 22cm Chaos Knight weighs nearly a kilogram...a miniature you can both play and concuss burglars with. Actually, given the bulky build and closely held sword, it probably wouldn't break! Obviously you won't be fielding this as a standard knight, but he'd make an excellent giant, god or someone affected by a growing spell. He isn't as detailed and refined as some Dolmen products, but there are few things more robust and "formidable". Just don't drop him on your foot. Other companies are producing many of the old Grenadier lines now and you'll find the figures scattered throughout this showcase. 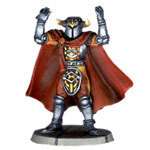 However, it's worth noting the 'Evil Foot Knights' from their Fantasy Warriors - Fighting Men range. These five miniatures are chaos knights incarnate, with large suits of armour, spikes and furs, but they're also dynamically posed (about to chop some innocent people to shred) and wielding a rag-tag set of weapons: two swords, an axe, a morning star and something you should probably use on a farm. These are quality 25mm figures, and well worth a punt on ebay. 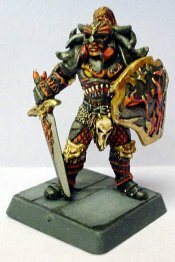 "Welcome to The Ral Partha Vintage Collection online catalog. Within this dusty tome you will find a plethora of miniatures that have been dug up from the dark depths of the Dragons lair...Please keep in mind when ordering that these are vintage miniatures and are cast from old molds, in some cases really old molds! Because of this, some of them may lack the crispness and fine detail they had when first released"
Well, that's what the website says, but can I get the online catalogue to work? Can I rollocks. In theory they produce a chaos line predating those contained in the Ral Partha section of this showcase...but precisely what they stock is uncertain. 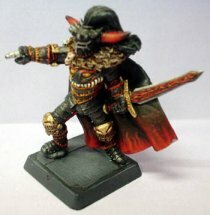 Ravens Forge sell Crimson Dragon Miniatures, whose policy is "Always $1, All the Time". To be honest, it's a pretty good job as their Death Knight is an indistinct sculpt, sporting the world's least threatening horns, an unusual helmet and a weapon which needs changing. And possibly a beard. That said, you can build a large unit very cheaply. The base is an all-in-one oval.